I grew up in the Panhandle of Florida, on a canal that leads to one of the bigger lakes in Northwest Florida. I was a 20 min drive away from the nearest gas station, 30 min away from a grocery store, and 45 min from the most beautiful beaches in the world. My dad still lives there, in the house I grew up in. Last I checked, the road was still not paved and the Google street view team hadn’t actually ventured down it. There were lots of places to explore, the woods (well really it was mainly scrub), the canal, the lake, etc. As a kid, I was always going outside. My parents always knew they could find me either reading a good book in my favorite climbing tree, or listening to my favorite music out on the dock while pretending to fish. And through all of these activities, unless I was venturing out past the mailbox, I was barefoot. This is a trait I got straight from my mother, and even now I kick my shoes off as often as I possibly can. Whether you believe that we were created by a higher being, or that we evolved into what we are today, you cannot deny that we have a connection to the Earth. Our sustenance comes from the earth and our bodies nourish the earth once we die. We are all part of that great cycle of life that takes place on this wonderful Earth. Our ancestors spent most of their lives, if not all of them, in direct contact with earth. In our current era of advanced technology, we spend most of our time indoors and when we do venture outside, we wear rubber soled shoes. The only time most people go barefoot is when they are at the beach, a lake, or a spring. I don’t know what caused people to stop going barefoot in their own back yards, but I do know that there are many, many benefits to going barefoot and I think we should bring barefoot back! The Earth has a natural magnetic field. This field is how we are able to use compasses to navigate. It also can help keep the electrons in our bodies balanced. I’m sure many of you have heard of the negative effects of positive ions on the human body, though you might only recognize that you have once I let you know that positive ions are also called free radicals. (Does that ring more of a bell?) Free radicals are ultimately what causes inflammation and they are being traced to quite a few health issues including cancer and even aging. When we come into direct contact with earth, our bodies naturally discharge a number of these positive ions. At the same time, we pick up negative ions which can help to negate any remaining positive ions in our bodies. So now we know one way to combat positive ions, but how do we keep getting more of them? Electronics and electro-magnetic frequencies are a big source of these. Anything with a power source that emits a signal will also be emitting positive ions. Things like cell phones, computers, tablets, e-readers, televisions, phone towers, and the list goes on and on. We are constantly being bombarded by these positive ions and putting ourselves in direct contact with the earth can help to counter the effects they have on our bodies. One of the effects of positive ions on our bodies is that of poor sleep quality. Have you ever spent a day outside, at the beach or maybe on the lake, and had the best sleep of your life afterwards? Part of this is just the physical activities of the day, or the relaxing atmosphere. But part of this has to do with discharging so many positive ions and flooding your body with negative ions. Negative ions are super relaxing and help us to get the best out of our night of sleep. Our bodies are around 60% water with our brain heart being up to 73%. The more negative ions we have in our bodies, the more conductive the water in our bodies is. This increases the speed at which the neurons can move between our nerve endings and our brains. Which can increase brain functionality. This also means that positive ions reduce that same speed, so our brain function is impaired when we are not spending at least 5 minutes a day in direct contact with the earth. Doing this can also help to increase emotional functionality which can help improve and stabilize our moods as well as maintain mental stability. Walking barefoot outside means that we will come into contact with a lot of different surfaces. Things like grass, wood, leaves, sticks, rocks, and sand. Each one of these surfaces has a different sensation. When we are walking barefoot, we are exposing our bodies to all of these sensations. The nerve endings in our feet transmit all this information to other parts of our bodies. When we wear shoes, we are missing out on these senses because our feet are not transmitting the information. It also makes us much more aware of our surroundings and forces us to be more present. If we are not aware and present, we may hit a particularly sharp rock, step in the excrement left by a neighbor’s dog, or even step on a wonderful little herb called stinging nettle. It’s called stinging nettle because it literally stings you if you touch it without protection, and it’s pretty common in this part of the United States. The chemical that causes the sting is the same chemical that causes the “fire” in fire ant bites, just to give you a little hint of how that feels. Our foot muscles have become dependent on our footwear over the years. This weakens them which puts more stress on other muscles in our bodies. When our feet muscles are unable to perform their duties, other muscles have to step in and fix the problems created this way. Some of the muscles and joints that can become strained when we do this include the lower back, neck, and knees. Walking barefoot helps to strengthen our foot muscles and ankles which can often lead to a decrease in pain in those previously mentioned areas. One of the more important factors in this is toe strength. Most people take these tiny digits for granted. I mean what are toes really used for? Balance and posture. When we wear shoes, our toes are squished together which has a negative impact on our balance and posture. Letting those tootsies free allows our toes to move and spread, like they are supposed to do, to help us maintain our balance and improve our posture. One other thing that has negatively effected our posture is a learned habit from a lifetime of wearing shoes, a pronounced pelvic-tilt. Typical walking and running shoes have about a 1 (or more) inch heel on them, though it is cushioned as opposed to the ever popular stiletto. To maintain our balance in this situation, we have to compensate by bending lightly forward at the waist, which strains our hamstrings, lower back, upper back, shoulders, and neck. Going barefoot helps to correct this tilt and bring us back into our natural posture which reduces all of that strain. When we are being flooded by positive ions, we are actually changing the electric currents in our whole body. This can easily effect our blood cells. Studies have been done that show that when we walk barefoot, we can actually change the surface charge of our red blood cells. This can reduce the clumping and change the viscosity of our blood. Viscosity is one of the major factors in heart disease and is why doctors recommend that people take asprin, or other blood thinners, on a daily basis. Also, the nerve endings in your feet, when stimulated, can decrease blood pressure as well as the fight or flight response. Back to those pesky little positive ions. Not only have they been connected to cancer and aging, but they are a major cause of inflammation in our bodies. Inflammation has been linked to quite a few diseases today. Diseases such as diabetes, arthritis, allergies, autoimmune conditions, asthma, anemia, cardiovascular disease, autism, and even Alzheimers. Discharging these ions helps to reduce the inflammation in our bodies thus reducing our likelihood to develop these issues and/or even reducing the extent of them. Our bodies are intricately connected. We can acutely feel this when we are in pain. Have you ever injured a specific muscle or joint, yet felt a connecting, or even traveling, pain on a completely different part of your body? This is called radiating. Our nerves connect our bodies in ways we don’t always understand. Using the radiating effect of these nerves to our advantage, we can improve function, reduce pain, and “massage” other parts of our bodies. Reflexology does this by working with different reflex points on our bodies. Our feet are a major hub of these points. 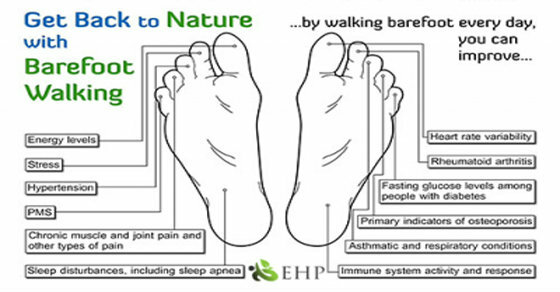 When we walk barefoot, we stimulate the nerve endings on the bottom of our feet which works as a natural reflexology, stimulating every point on our body, giving us a natural and gentle massage as we walk. So the next time you wander out into your back yard, or decide to go for a walk in the park (or even go hunting for Pokémon) consider shedding your shoes and getting back to barefoot.